1864 – Death of Nicholas Callan, Irish priest and scientist from Darver, Co. Louth. 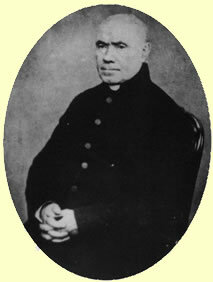 Nicholas Callan (20 December 1799 – 14 January 1864), was a Irish priest and scientist from Darver, Co. Louth. He was Professor of Natural Philosophy in Maynooth College from 1834, and is best known for his work on the induction coil. Callan was ordained a priest in 1823 and went to Rome to study at Sapienza University, obtaining a doctorate in divinity in 1826. While in Rome he became acquainted with the work of the pioneers in electricity such as Luigi Galvani (1737-1798) who was a pioneer in modern obstetrics and Alessandro Volta (1745-1827) who is know especially for the development of the electric battery. In 1826, Callan returned to Maynooth as the new Professor of Natural Philosophy (now called physics), where he also began working with electricity in his basement laboratory at the college. Influenced by William Sturgeon and Michael Faraday Callan began work on the idea of the induction coil in 1834. He developed his first induction coil in 1836. An induction coil produces an intermittent high-voltage alternating current from a low-voltage direct current supply. It has a primary coil consisting of a few turns of thick wire wound around an iron core and subjected to a low voltage (usually from a battery). Wound on top of this is a secondary coil made up of many turns of thin wire. An iron armature and make-and-break mechanism repeatedly interrupts the current to the primary coil, producing a high-voltage, rapidly alternating current in the secondary circuit. Callan invented the induction coil because he needed to generate a higher level of electricity than currently available. He took a bar of soft iron, about 0.61 m long, and wrapped it around with two lengths of copper wire, each about 61 m long. Callan connected the beginning of the first coil to the beginning of the second. Finally, he connected a battery, much smaller than the enormous contrivance just described, to the beginning and end of winding one. He found that when the battery contact was broken, a shock could be felt between the first terminal of the first coil and the second terminal of the second coil. Further experimentation showed how the coil device could bring the shock from a small battery up the strength level of a big battery. So, Callan tried making a bigger coil. With a battery of only 14 178 mm plates, the device produced power enough for an electric shock “so strong that a person who took it felt the effects of it for several days.” Callan thought of his creation as a kind of electromagnet; but what he actually made was a primitive induction transformer. Callan’s induction coil also used an interrupter that consisted of a rocking wire that repeatedly dipped into a small cup of mercury (similar to Page). Because of the action of the interrupter, which could make and break the current going into the coil, he called his device the “repeater.” Actually, this device was the world’s first transformer. Callan had induced a high voltage in the second wire, starting with a low voltage in the adjacent first wire. And the faster he interrupted the current, the bigger the spark. In 1837 he produced his giant induction machine: using a mechanism from a clock to interrupt the current 20 times a second, it generated 38c m sparks, an estimated 600,000 volts and the largest artificial bolt of electricity then seen. Callan experimented with designing batteries after he found the models available to him at the time to be insufficient for research in electromagnetism. He invented the ‘Maynooth Battery’ in 1854 and a single fluid cell in 1855. Previous batteries had used rare metals such as platinum or unresponsive materials like carbon and zinc. Callan found that he could use inexpensive cast-iron instead of platinum or carbon. For his Maynooth battery he used iron casting for the outer casing and placed a zinc plate was immersed in a porous pot (pot that had an inside and outside camber for holding two different types of acid) in the centre. In the single fluid cell he disposed of the porous pot and two different fluids. He was able to build a battery with just a single solution. Callan also while experimenting with batteries built the world’s largest battery at that time. He joined 577 batteries together using over 30 gallons of acid. He measured how much his electromagnet could weigh with various batteries to measure their strength as the instruments to measure current or voltages had not yet been invented. His best effort lifted 2 tons. The Maynooth battery went into commercial production in London. The batteries that Callan designed had a very high voltage output when connected to coils of wire. Those coils produced electrical shocks. Again Callan didn’t have instruments to measure voltages so he used students to take shocks from his batteries and coil circuits. He then estimated the level of the voltage from their reactions. One of his students called William Walsh was rendered unconscious by one of his circuits. Thereafter Callan was persuaded by the Collage to be more careful with students. He then switched to electrocuting turkeys. Callan also discovered an early form of galvanisation to protect iron from rusting when he was experimenting on battery design, and he patented the idea. He died in 1864 and is buried cemetery on the south campus of St. Patrick’s College, Maynooth. The Callan Building on the north campus of NUI Maynooth, a university which was part of St Patrick’s College until 1997, was named in his honour. In addition, Callan Hall in the south campus, was used through the 1990s for first year science lectures including experimental & mathematical physics, chemistry and biology. 1753 – Death of George Berkeley, Irish philosopher and Anglican. 1871 – Alexander Sullivan, barrister and last King’s Serjeant of Ireland, is born in Dublin.